By default, Spreadsheet Editor automatically saves your file each 2 seconds when you work on it preventing your data loss in case of the unexpected program closing. If you co-edit the file in the Fast mode, the timer requests for updates 25 times a second and saves the changes if they have been made. When the file is being co-edited in the Strict mode, changes are automatically saved at 10-minute intervals. If you need, you can easily select the preferred co-editing mode or disable the Autosave feature on the Advanced Settings page. click the File tab of the top toolbar and select the Save option. choose one of the available formats depending on your needs: XLSX, PDF, ODS, CSV. Note: if you select the CSV format, all features (font formatting, formulas etc.) except the plain text will not be preserved in the CSV file. If you continue saving, the Choose CSV Options window will open. By default, Unicode (UTF-8) is used as the Encoding type. The default Delimiter is comma (,), but the following options are also available: semicolon (;), colon (:), Tab, Space and Other (this option allows you to set a custom delimiter character). click the File tab of the top toolbar and select the Print option. The Print Settings window will open, where you can change the default print settings. Click the Show Details button at the bottom of the window to display all the parameters. Note: you can also adjust the print settings on the Advanced Settings... page: click the File tab of the top toolbar and follow Advanced Settings... >> Page Settings. Some of these settings (page Margins, Orientation and Size) are also available at the Layout tab of the top toolbar. 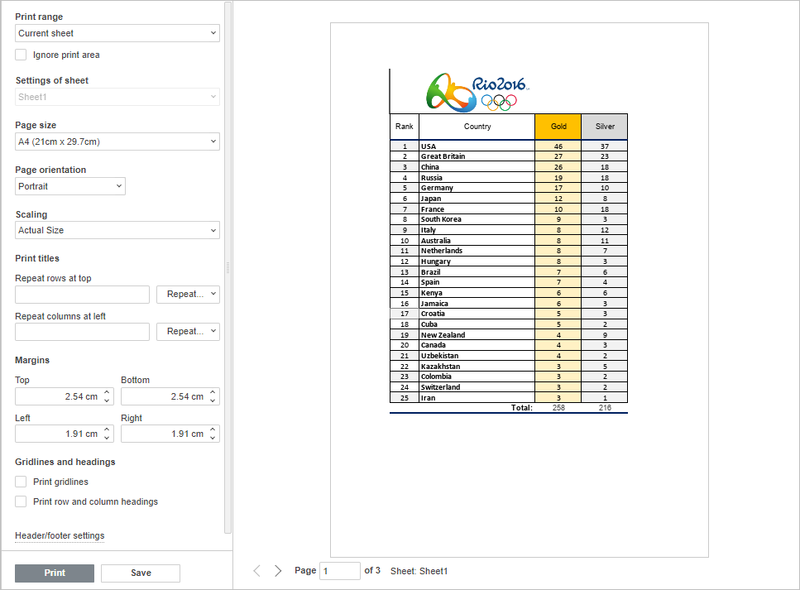 Print - specify the worksheet elements to print checking the corresponding boxes: Print Gridlines and Print Row and Column Headings. When the parameters are set, click the Save & Print button to apply the changes and close the window. After that a PDF file will be generated on the basis of the spreadsheet. You can open and print it out, or save onto your computer hard disk drive or removable medium to print it out later.